Popular Mechanics has a great series of articles today on amateur astronomy, including Affordable Ways to Become an Amateur Astronomer, and How to Computerize Your Telescope. But my favorite is the Top Five Galactic Bodies Anyone Can See With a Cheap Telescope. 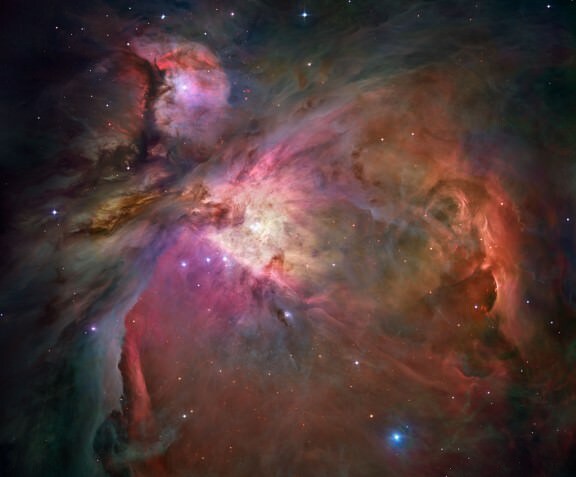 Number one on the list is the Orion Nebula, above. Granted, with small telescopes, it won’t look like this Hubble Space Telescope image, but The Great Nebula is even visible with the naked eye in the northern hemisphere, and looks pretty impressive in small telescope, too. To find it, those in the northern hemisphere will have to wait until cooler weather approaches. But look for Orion’s belt, three bright stars in a row. Hanging south from the belt is Orion’s sword, composed of three bright dots; the center dot is the great nebula. Number two is the Andromeda Galaxy. A.K.A M31, this beautiful galaxy is another naked eye object that shows up well in small telescopes. To find it, locate the North Star, then the constellation Cassiopeia, which looks like a giant “W” and is directly across the Big Dipper, with the North Star in between the two. Look at the right “V” shape within the larger “W” of Cassiopeia; 15 degrees down from the tip of the ‘V’ is M31. Popular Mechanics recommends using the lowest power on the telescope to get as much as the galaxy into the field of view as possible. Number three is the Hercules Globular Cluster. It is relatively close, only about 25,000 light-years away and it pretty big –about 150 light-years wide, making it an easy target. Hercules is best viewed from the northern hemisphere in the summer months during a new moon. Locate Hercules by looking for the trademark trapezoidal keystone within the constellation. M13 is the brightest spot on the western side of the shape, about 20 degrees due west of the constellation Lyra. Number four on the list is the Crab Nebula. This is the left-overs from a supernova that occurred in the year 1054. Back then it was bright enough to see in the daytime, and now it makes for a great sight at night, but a telescope is required. M1 is located on the southern horn of Taurus, the bull shaped constellation southeast of Orion. The object is best seen using a 200x zoom from the northern hemisphere around midnight. Number five is the Whirlpool Galaxy. A.K.A. M51, this is one of the largest galaxies visible without using professional telescope. Millions of years ago two galaxies collided to create this colorful and dramatic object. To find it, look about 3.5 degrees southeast of the last star in the Big Dipper’s handle. There are probably tons more that are also visible by a small telescope, but I would add the Ring Nebula (M57) also. I have a 10″ Celestron telescope, which is pretty powerful, but I’m pretty sure I’ve seen the Ring Nebula with some of the lower power eye-pieces. Not much detail, and pretty small, but it’s still fun to look at. It’s in the constellation Lyra almost directly between Sheliak and Sulafat. No – not until winter (in the Northern hemisphere)! Well, except in the daytime, which isn’t a lot of use. And for the Southern hemisphere, Orion will be in the North when it’s visible come Summer. Taurus is northwest of Orion (and remember, in the sky, if North is at the top, then East is to the left and West is to the right, as implied in the description of M13’s position). Slight typo — the supernova was in 1054, not 1045. Well, that rules out Miss Smith’s window, across the street. M1 and M51 in a small telescope? Yeah right! Depends what you regard as ‘small’ I suppose. On the other hand M57 (Ring Nebula) and M27 (Dumbell nebula) are entirely feasible in a 4″ telescope. As for galaxies, M81 and M82 are very clear in a 4″ instrument. vagueofgodalming: M1 (and Orion) rise today just before the sun here in Austin, Texas, USA. If you get up early in the morn (or stay up all night), it heralds the coming end of summer. It is still rather close to the sun but will separate more in the coming week or so. The night is long – not all of us miss those nice cooler hours before Apollo grabs the reins of his chariot! I love YES for the he Pleiades (M 45)! And I question whether galaxies belong in the top five of Galactic objects. Andromeda and the Whirlpool are Extragalactic by nature. Mmmm, so what would be number 5? i typo, therefore i am. I VOTE yes for the Pleiades (M45)! A weeee bit of hype here. – Orion – yes, very impressive, can spend hours looking at it. – M13 – same, will give more with every increase in mag. – M1 – Blah – a small fuzzy snowball, no detail. – M51 – a fuzzy snowball with a faint fuzzy snowball nearby. Thanks to light pollution, my 10″ sees things the way a typical 4″ scope sees them. … I live in the suburbs of Vancouver BC, in Pitt Meadows. A 45+ minute drive to downtown Vancouver. About five years ago on an exceptionally clear night in March at a dark sky site in New Jersey, I saw the core structures of M51 and its attached companion as well as the dust lane in M104 (Sombrero galaxy) through a Stellarvue 80-mm f/9.4 refractor. When you combine dark skies, excellent transparency, and high-quality optics, you can see a lot through small aperture telescopes. Next PostNext Opportunity Spies Unusual Rock — Large Meteorite?